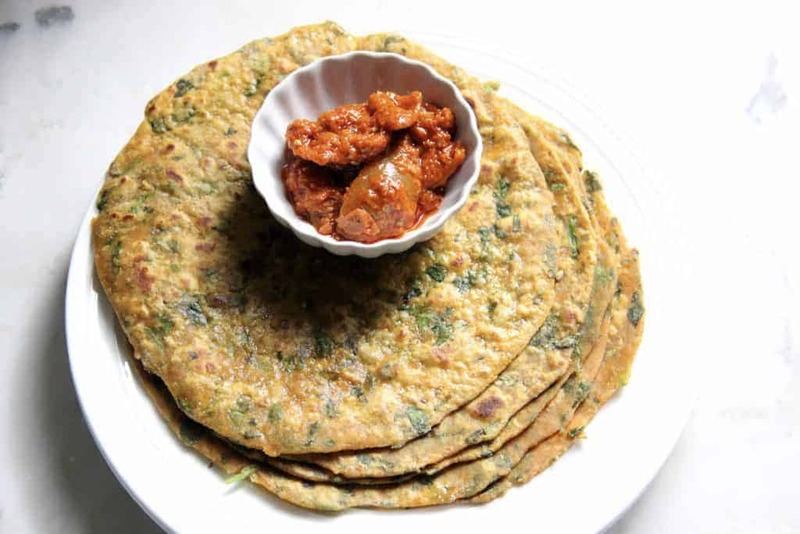 Methi Thepla are savory thin Indian flatbreads made with whole wheat flour, fresh fenugreek leaves and are spiced with turmeric, red chili powder, carom seeds and sesame seeds. 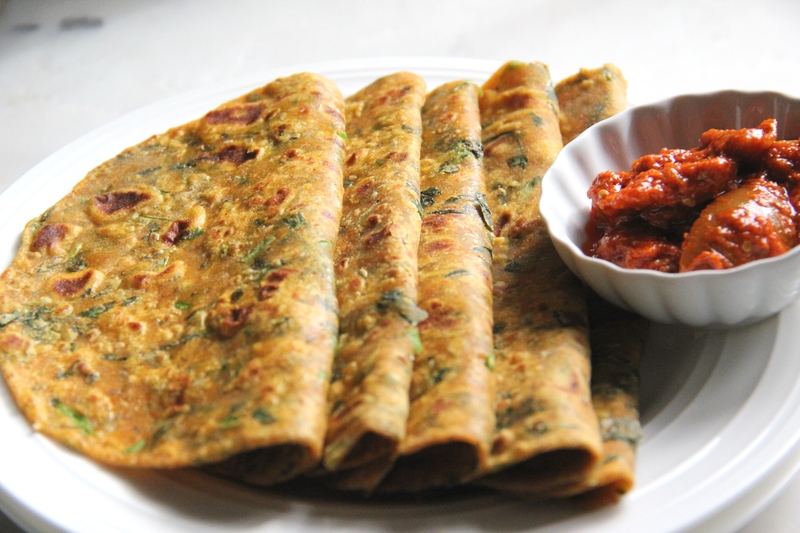 Best way to enjoy these thepla are by dipping them with pickles and yogurt. 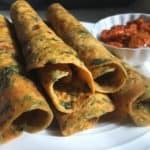 My older son enjoys Thepla without any condiments as they are so flavorful, while my younger son loves them with ketchup. 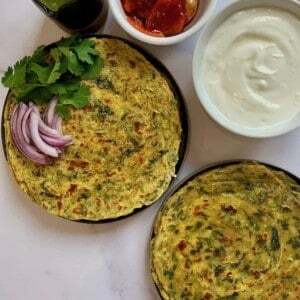 For me, Thepla bring memories of my mom making them and the aroma of fenugreek leaves and ghee all over the kitchen as mom served them hot off the pan, ‘garam garam’ as she calls them. 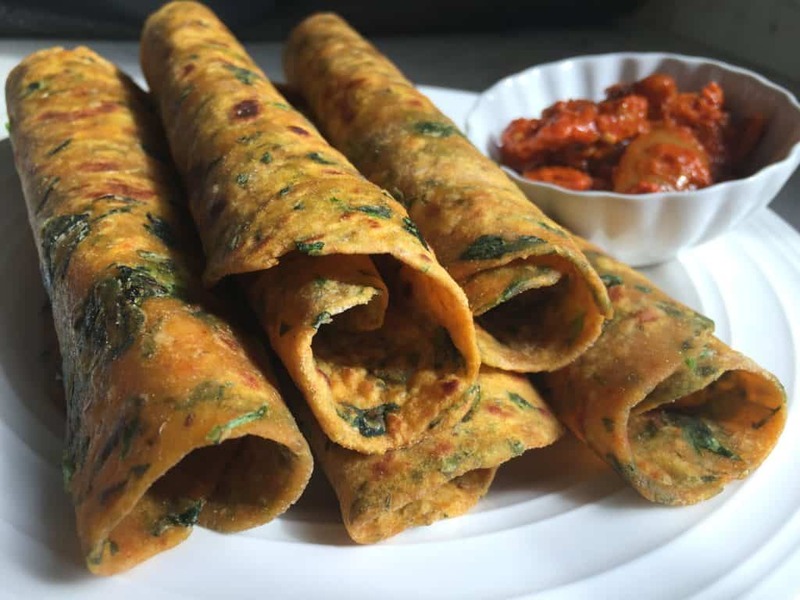 Thepla are thinly rolled Indian flatbreads. The dough is made with whole wheat flour that is kneaded with leafy greans such as methi, spinach, etc and spices such as turmeric, red chili powder, ajwain/carom seeds and sesame seeds. To make thepla all the incredients are kneaded together to form dough which is then rolled into thin flatbreads. Making Thepla is much easier as you just have to get the overall consistency of the dough right. Stuffed Paratha is a 2 step process. First, the outer dough is kneaded with wheat flour and then the inside filling is made seperately. The inside filling is covered with the wheat dough and then gently rolled before cooking on a stove-top griddle/pan. Making stuffed paratha can be a bit tricky as you need to get the consistency of the outside dough as well as filling right. Traitionla Methi Thepla recipe does not have sweet potato in it. 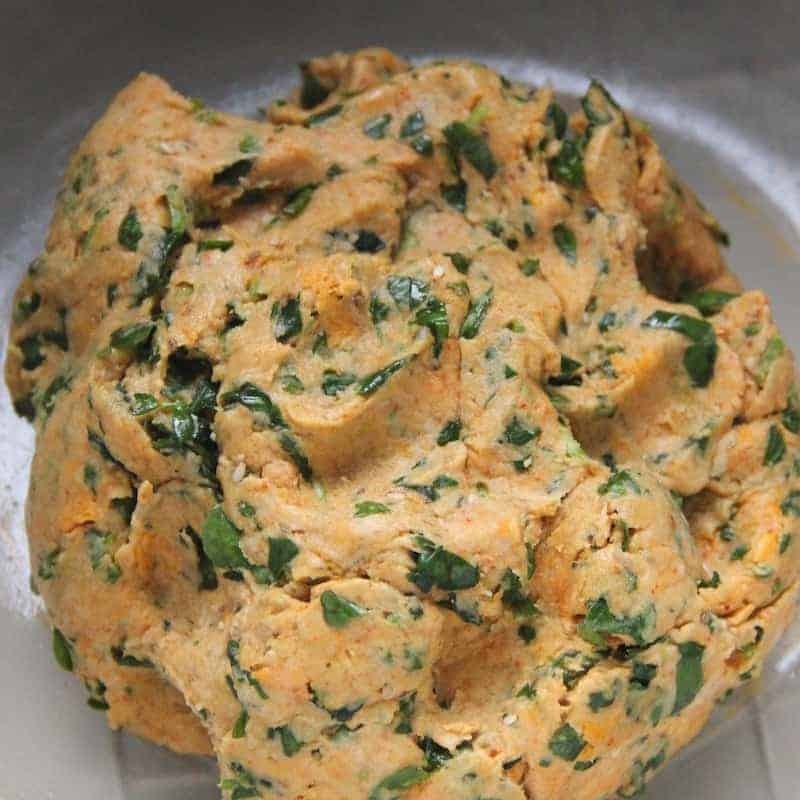 I love to add cooked and mashed sweet potato to the wheat flour, along with fresh methi and spices while making the dough. 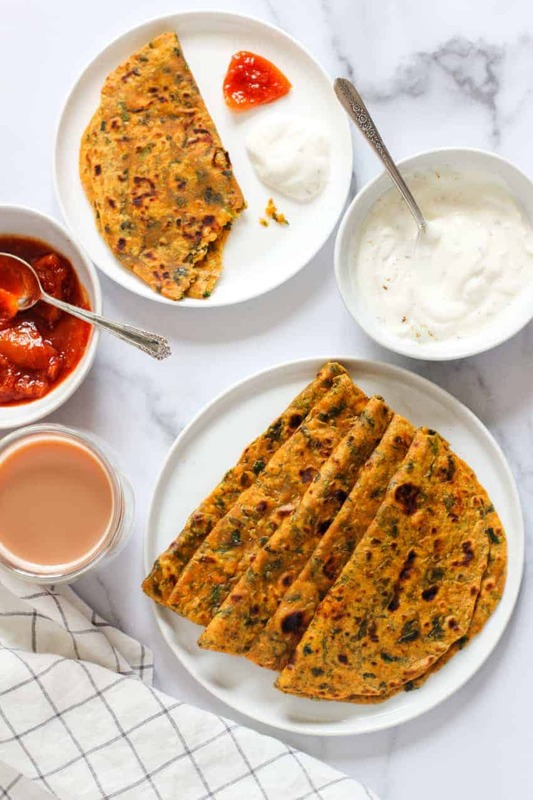 Sweet potatoes give these parathas very soft yet crispy texture and also add extra nutrition. Methi/Fenugreek leaves and sweet potatoes are packed with vitamins and minerals. Spices like turmeric, sesame seeds and carom seeds are known for their medicinal properties and health benefits. Turmeric – Anti-inflammatory, Sesame seeds – health boosting minerals, Carom Seeds – maintains digestive health. Love serving for breakfast, lunch or dinner with a dollop of yogurt or a spoonful of spicy achar/pickle. Made ahead recipe. 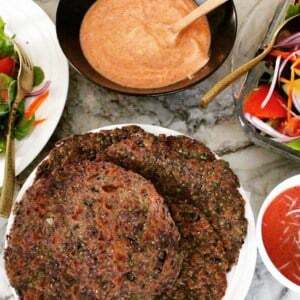 Cooked Methi Thepla stay well at room temperature for 2 to 3 days so you can also take them along on your trips. They stay refrigerated for up to a week or freeze them for longer shelf life. While making dough only add a little bit of water at a time. Chopped fenugreek leaves can be very moist, requiring very little water to make soft pliable dough. Dough can also be refrigerated for 3-4 days in an airtight container making it a great meal prep recipe. Roll the theplas gently without putting too much pressure so they will come out soft. They can be rolled thick or thin depending on your preference. Eitherway they will be delicious. When cooking the thepla on the dough, gently press with a silicone spatula. Over pressing thepla can make them hard. Add ghee or oil when the thepla is golden brown on both sides and just before taking it out of the pan. Wash and finely chop fenugreek leaves. Boil the sweet potato. Peel the skin off and mash the potato. 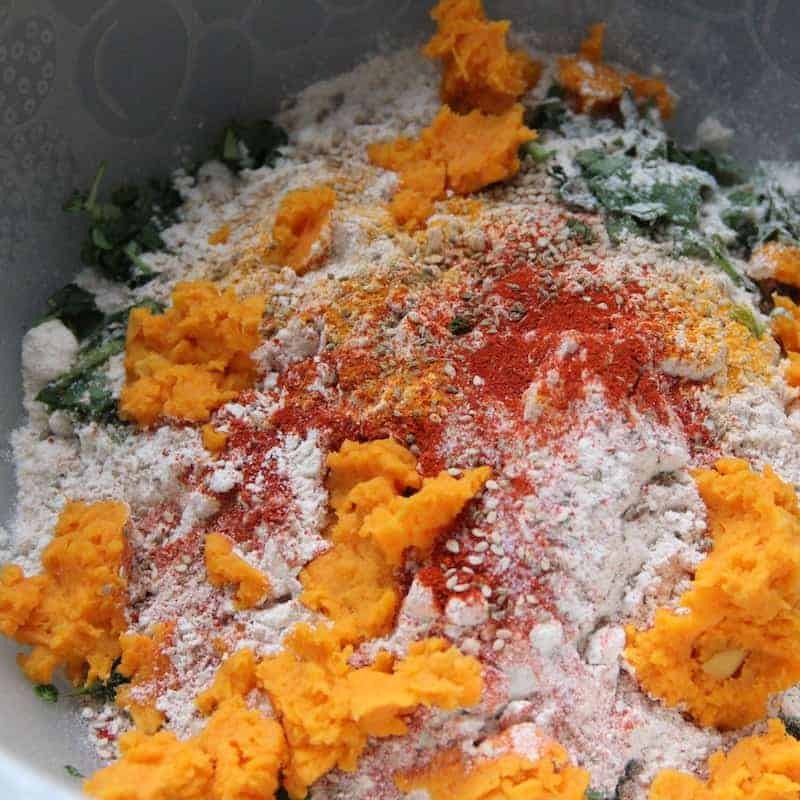 In a big mixing bowl add 2 cups of flour, all the spices, fenugreek leaves and mashed sweet potato. Add 1 tbsp of oil. Mix well and knead soft dough with the water. You may need more or less water to make nice soft dough. Add remaining 1 tbsp of oil and knead the dough for couple of mins. Let the dough rest for 10 mins. Make tennis ball sized balls from the dough. Dip into remaining dry wheat flour one at a time and roll into round parathas to your desired thickness. Heat a griddle on medium-high heat. Put the rolled paratha on the griddle and cook on both side until the paratha turns golden brown and crispy. Apply little bit ghee on both the side. Roll and cook rest of the parathas. Serve hot with pickle and yogurt! ♥ We LOVE to hear from you! 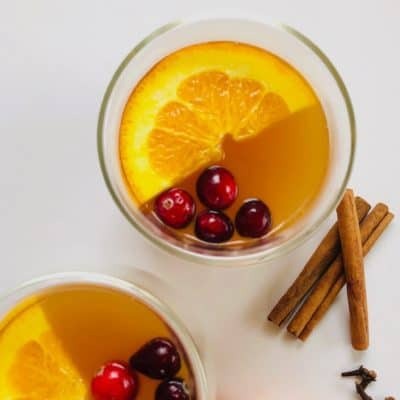 Did you try this recipe? Please share your food photo with hashtag #ministryofcurry on Facebook or Instagram, so we can see it and our followers can enjoy it too! Thank you and Happy Cooking ♥ Subscribe to our Youtube Channel for tasty and easy video recipes. Looking for more Instant Pot recipes? 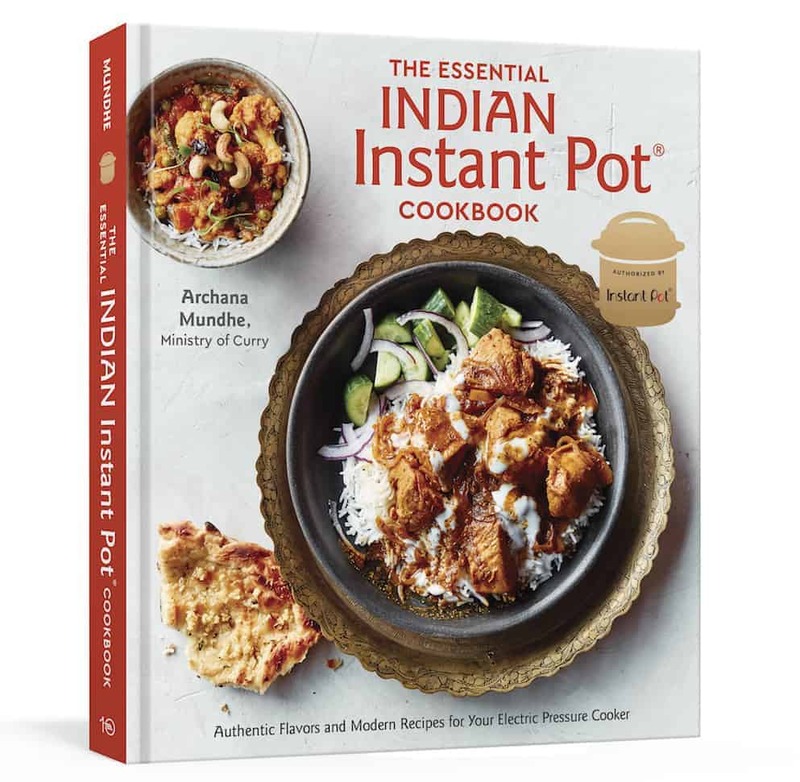 Check out our delicious Instant Pot Recipe board on Pinterest. The parathas look amazing and sound delicious. Yes it’s so healthy and gives a beautiful texture! Thank you! 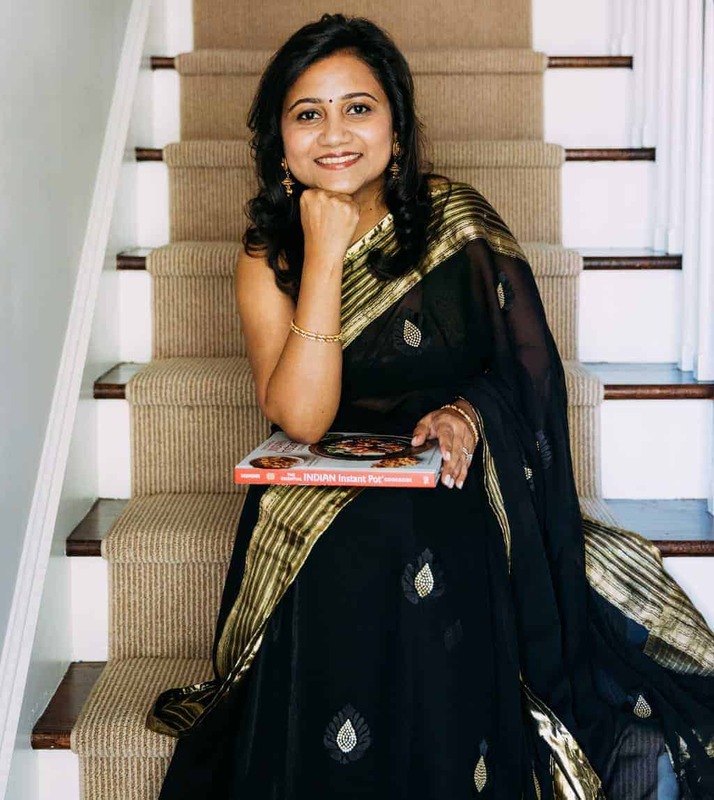 I love methi too! Could you use dried methi leaves? If so, how much would you use? Thank you! Hi Kat! You can def use dry methi leaves. Thye have a different flavor but are very yummy! I would also only put half the quantity as that of fresh methi leaves. Let me know if you have any questions. Thank you very much! I just made them for dinner, and they were very nice! Yum.. love how you got them thin. Amazing click. What kind of “frying pan” are you using to make those delicious paratha. Hi Samantha, They are just flat griddles/crepe pan. Yummy!!! Kids and I loved it !!! Just tried this today. It was awesome and the whole family loved it. 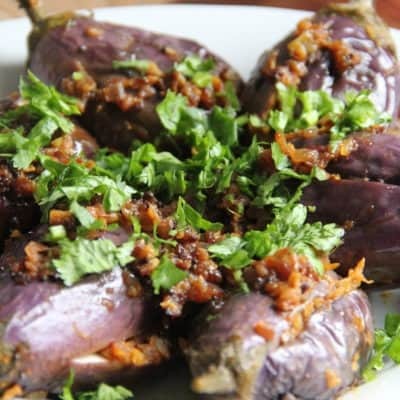 Wonderful why to sneak in sweet potato into the meal.